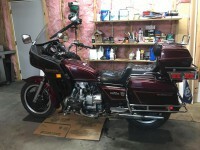 hello everyone!I have a 1982 gl1100I and my rear brake has locked up,took off the caliper,the pistons move nice and free,but if i try to push them both all the way back at the same time, they wont budge, so it seems i have an issue with the rear master cylinder, but what could it be?any thoughts?thanks in advance..
probably the wee little bypass hole in the master cylinder. takes a fine wire to clean it out. I have an 82 Aspencade. had the same problem. rebuilt the caliper(2 times). rebuilt the master cylinder. changed brake line. brakes still locked up. I bought a after market master cylinder. was about to install it when I seen that someone on THIS site had the same issue. I read on what to do about it. it was SIMPLE. when you remove the resivour tube from the master cylinder. just remove the 2 screws and pull the entire hose fitting off of the master cylinder. there are 2 small holes. one larger then the other. the smaller of the 2 is the pressure release. it doesn't look like it does anything. IT DOES. there is a hole there...it's less then a MM in size.. it must be clean. simply spraying brake cleaner will NOT work. I used a small wire to get all the crud out of the hole. then used brake cleaner. be careful when cleaning out the hole. I looked for months for a replacement master cylinder. I found 1 on ebay and it looked like crap. I had a spare MC, but it wasn't much better then what i found on ebay. that's why I bought the after market one..it wasn't the exact one I needed but i could have made it work. like I said be careful, parts are hard to find for these old bikes. the same would apply if the front brakes do the same. in the front master cylinder there is also 2 small holes. both must be clean, and allow fluid to flow thru.